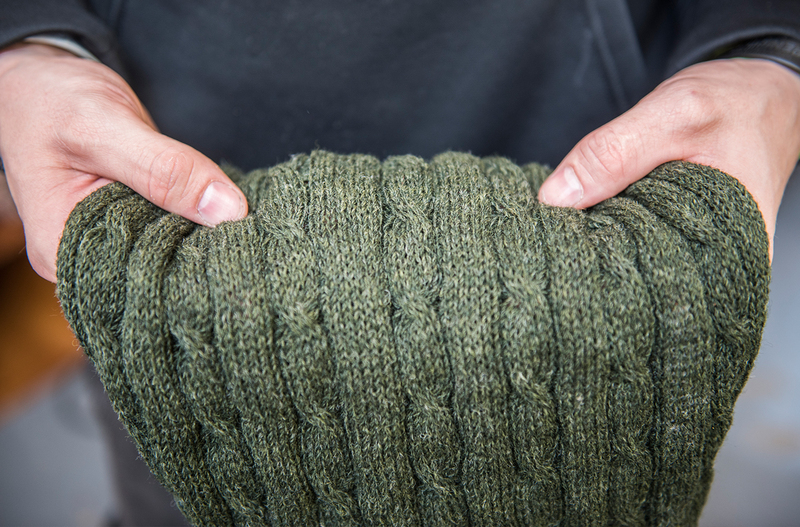 We recommend wet-finishing garments made from our yarns, with a two-stage scouring process. The first scour will remove the oils we use in producing the yarn and the second will create the desired level of surface and softness. The first scour should take place at 40° C, with around 15 litres of water to 1kg of goods. A detergent or other agent should be added, up to 10% of the weight of goods to remove the processing oils. The wash cycle can be up to 5 minutes followed by draining and rinsing with clean water. The second scour should proceed at 40° C, together with half the previous amount of the same detergent or other agent. This cycle should continue until the desired finish is obtained, followed by draining and rinsing with clean water. The garments may then be spin-dried and if desired, a fabric softener can now be added, to no more than 1% of garment weight. No further rinsing should be necessary, but the garments could be drained and spun dry again. Finally, garments may be tumble-dried.